Drake's Cakes is proudly celebrating their 120th birthday and they are giving presents away! Enter to win a Winnebago road trip, gift cards, snack cakes, Thermos products and more! Grand Prize: The Grand Prize Winner will receive one two-week road trip in a Winnebago vehicle; one (1) $120 Visa Gift Card; one (1) Winnebago-branded prize consisting of a LuminAID PackLite 16 Solar Light; two (2) DRAKE’S-branded products consisting of a Field & Co. 20” Duffel Bag and a Thermos Stainless King Beverage Bottle; and a selection of DRAKE’S-branded products for consumption during the road trip. The estimated retail value of the Grand Prize is $4,332.83. 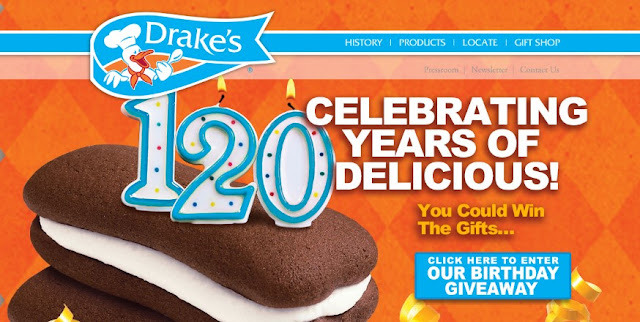 Daily Second Prizes: Each of the one hundred and twenty (120) Daily Second Prize Winners will receive one (1) DRAKE’S-branded product consisting of a Thermos Stainless King Beverage Bottle. The estimated retail value of each Daily Second Prize is $55.00. Daily Third Prizes: Each of the one hundred and twenty (120) Daily Second Prize Winners will receive one (1) DRAKE’S- branded product consisting of a Field & Co. 20” Duffel Bag. The estimated retail value of each Daily Third Prize is $31.00. Daily Fourth Prizes: Each of the one hundred and twenty (120) Daily Fourth Prize Winners will receive one (1) WINNEBAGO-branded product consisting of a LuminAID PackLite 16 Solar Light. The estimated retail value of each Daily Fourth Prize is $24.95. This Sweepstakes ends on 09/29/16 and you can ENTER EVERY 24 HOURS to win.